People who follow after Christ are far from a majority in this world. We find ourselves struggling in a community that has little concept of who we are as a Church. Most think it’s a closed group of unintelligent “sheep” who are overwhelmed with rules that have no benefit other than satisfying a fictitious, controlling Deity. Most churches are struggling to gain members. We’ve lost relevance. Sadly, the benefits of a vibrant Christian life are not being communicated well. The universal Church, your local church, needs to start focusing on external communications rather than getting bogged down with internal communications like bulletins, video announcements, websites, and social media groups. You have to create church branding that will reach outside of your walls and attract people to your worthwhile mission. It’s the best way to reach our world for Jesus. Understand your Reach Community. Track where your current congregation is from. Neighbors near your families have a large chance that they’ll like your style (if you’re somewhat current). Plot your families on a map and declare that area (where the majority are) your reach community. Know their concerns, problems, goals; and be known for a solution to them or path to their goals. Get a demographic study of the area (from companies like us, your chamber of commerce, or google the info for your area) and identify what’s on the minds of the majority. Do you even know the largest demographic groups? People want to connect with solutions. We know Jesus is the Solution to all their needs, but get their attention through a temporal benefit so you can then connect with the Divine. Like Jesus did when he engaged with the woman at the well by talking about water. Communicate those benefits consistently with a controlled visual and a controlled message. Create a brand positioning (tagline) that’s 3-5 words that clearly communicate a benefit for your community. Attach it to your simple logo, then control how it’s pushed into the community. Only use certain fonts and colors and the same keywords in your messaging — use ones that people would be googling (looking for) in your community. This is solid church branding. If you don’t have one that reaches the people in your surrounding areas, you’re destined to feed your internal flock until they all get older and older. And soon you’ll be older than your community’s average age. Sadly becoming known as the Irrelevant Church to the majority. So start now. 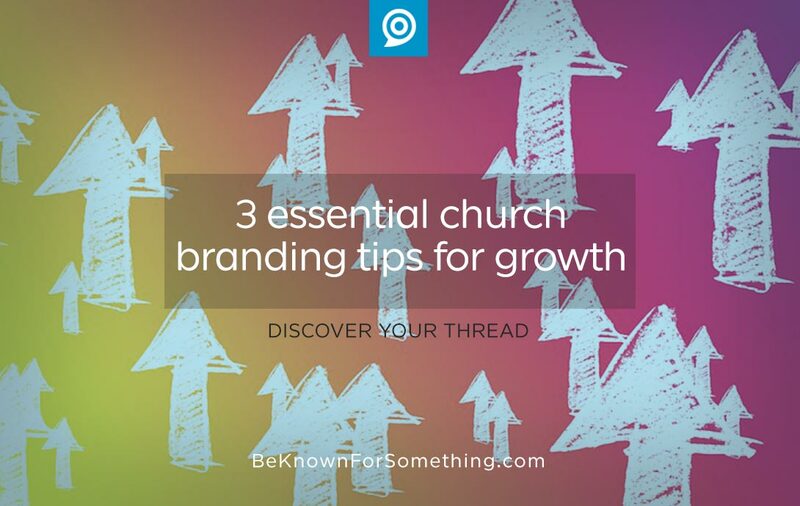 Create a solid church brand and communicate it.